In this edition, The Goonies go head to head with David and his brood of teenage bloodsuckers. Will the Truffle Shuffle win against motorcycling vamps? Very rarely do films come out around the same time frame from similar creators that tend towards the same trajectory, exploring the same ideas with a like-minded sensibility. But in the case of the Steven Spielberg produced The Goonies and the subsequently Richard Donner produced The Lost Boys, with its crossover casting, kindred themes and approach to teenagers off the beaten path contending with forces of darkness shot on elaborate set pieces that look and feel borne out of late '80s youthful rebellion, it’s harder to differentiate these two movies than you may think. With this unique focus from The Movie Sleuth, we take a good concerted look at both of these movies on their own, their comparability and in the end decide which one of the two we think is better. us there'd be vampires here." In a time when adventure ruled the box office, The Goonies came along and offered up a unique tale of an impassioned group of kids on a mission to save their homes. This righteous group of teens and goofy pre-teens brought a sensibility and familiar quality that spoke volumes to the audience it was aimed for. Armed with comedy, thrills, and plenty of booby traps, The Goonies took the adventurous themes of Indiana Jones, mixed them with a valiant focus on teamwork, and topped it off with a dark edge that would surely keep its adult audience happy too. The Goonies is symbolic of a period when movies were still based on character development, practical effects, and a whole lot of heart. And it still holds up today. This was a non-typical type of movie for the time and spawned numerous imitators that could never hold a candle to Sloth and this gang of smart mouthed kids. Seeing this as a child, Spielberg’s hands and style could be felt all over this thing. Even in my youth, his presence was a noticeable force that would always be omnipresent in this nearly perfect motion picture. Armed to the gills with familiar Spielberg-esque tropes, The Goonies is a masterful meeting of the minds comprised of an excellent score, a fun soundtrack headed up by Cindi Lauper, tons of phenomenal looking set design, and an almost perfectly rendered story about friendship that headily feels like Spielberg actually directed. 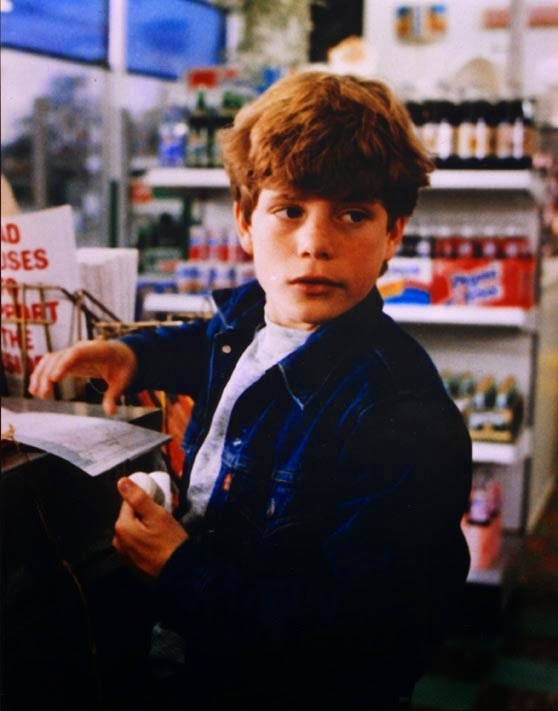 Headed up by an adolescent Sean Astin and his band of merry social outcasts, The Goonies still works to this very day. The fan base continues to grow as more and more kids find out about this movie. A few years back, it was introduced to my own children and they were proof positive that this will stand the test of time. Its moral compass is pointed in the right direction, the characters each have social meaning, and the core story about an angst filled group of kids fighting against the man still holds true today. The Goonies transcends time, still looks good, and has a rare quality that will keep it at the forefront of childhood adventure movies for a long while to come. 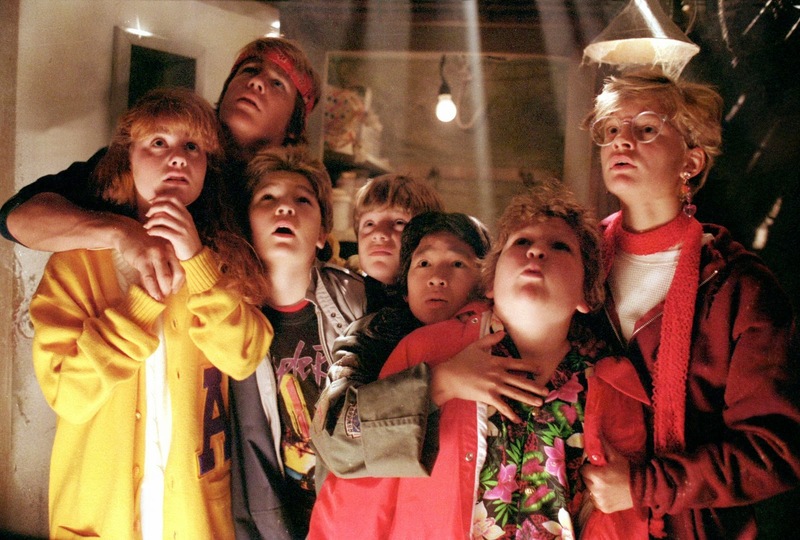 Without its excellent cast of comically skilled youths and an evil Anne Ramsey, The Goonies may have flopped. Fortunately, all the pieces of this mysterious puzzle fit together, creating a classic tale that takes audiences through darkened caverns, pirate ships, and eerie settings that deliver a good, old school adventure that holds a special place in my heart. Years before littering the comic-book world with the abominable Batman & Robin, Joel Schumacher directed this flamboyant and colorfully stylized '80s rock horror flick which has long since become a classic in the canon of bloodsucking lore. Picking up almost where The Goonies left off and aimed at an adult audience with its R rated gore is the '80s punk vampire thriller The Lost Boys. Similarly focused on kids settling into the beached region of Santa Cruz, California during the height of summer carnivals and concerts, the film stars Jason Patric and the late Corey Haim as two brothers living with their single mom who begin to suspect the area is being assailed repeatedly by something less than human. Enter Kiefer Sutherland and his biker gang of young troublemakers bent on turning the region upside down and luring Patric into their collective. Patric doesn’t know it yet, but Sutherland’s posse is determined to turn the impressionable youth into a fellow feeder. It’s up to Haim and the Frog brothers (fresh off The Goonies Corey Feldman and Jamison Newlander), a duo of comic book geeks who know more about battling the undead than they let on. 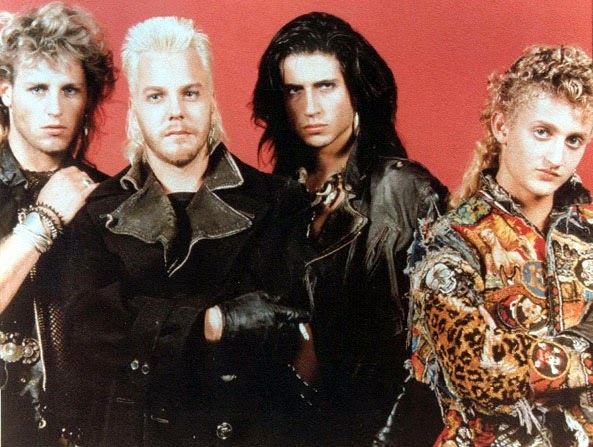 A product of the era of late '80s teen rebellion laced with Jim Morrison iconography and synth pop echoing the lush androgyny of Purple Rain, The Lost Boys is a classic entertainment and one of the quintessential vampire horror comedies with the best visual effects and cinematography money can buy. 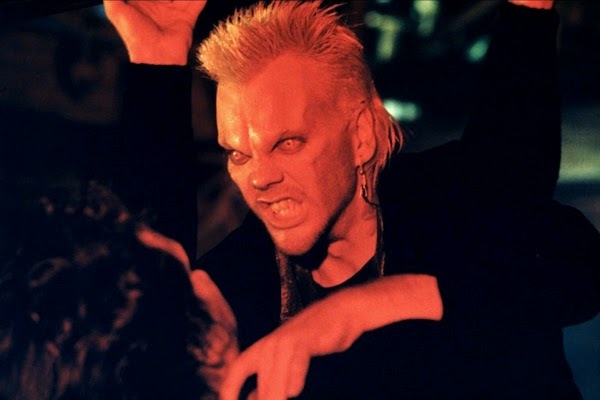 Lensed by the great Michael Chapman (best known as Martin Scorsese’s director of photography), The Lost Boys is largely composed of deep reds, bright whites and carnivalesque neon-fluorescent colors of the theme park rides adorning the region. As with Scorsese’s work, Chapman is best known for his deep focus cinematography and fast zooms, a characteristic Paul Thomas Anderson would incorporate into his own work with Boogie Nights and Magnolia. "We better win this match." In terms of performances, this is best known as the movie that put Corey Haim on the map. Fresh off of Lucas, the boyish comic charm of Haim is given free rein to run wild here. Counterpointing Haim is the "other" Corey (Feldman); the two would pair together and eventually become known as The Two Coreys. While they only managed another success with License to Drive before Haim’s eventual sad foray into addiction, The Lost Boys represents the apex of that working relationship between Haim and Feldman. And of course it goes without saying the film’s strongest assets belong to Jason Patric and Kiefer Sutherland going toe to toe. Sutherland seems to have stepped right off the set of Stand By Me with his equally dangerous young thug, donning a spiked blonde haircut which can’t help but stop people dead in their tracks with fear. The underrated Jason Patric would ultimately go on to become a well-known character actor, eventually sharing the screen with Ray Liotta in the crime drama Narc, but it is here that the long haired Morrison lookalike would make his presence known in the film world. 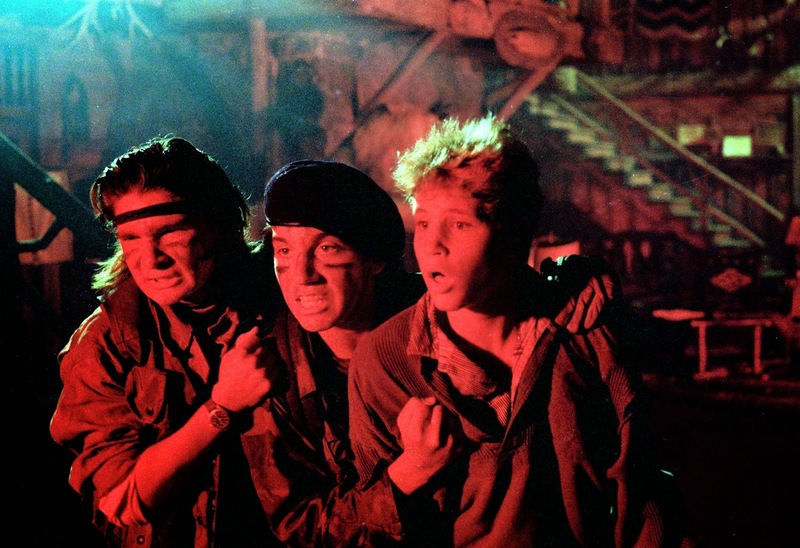 Both a teen comedy spoken of the same chaotic comic breath as The Goonies but far more refined and controlled and a time capsule of the era when it was made, The Lost Boys puts a unique spin on the vampire genre. It manages to mix both the rock star glamour and teen punk demographic with the age old tale of the undead thirst for blood and immortality. It’s also just plain fun and manages to provide its share of scares and laughs in equal measure, making for an all-around thrilling package of nostalgia with visual effects and camerawork far ahead of its time. While overtly flawed and not aiming for the transcendent heights established by the likes of Kathryn Bigelow’s apocalyptic and gloomy biker gang take on bloodsucking Near Dark, The Lost Boys is undoubtedly a spectacular old fashioned time at the movies and one of the most memorable and iconic vampire thrillers ever made! There’s far more to this one than pure '80s nostalgia. "We can't believe this crap. Despite our glowing sentiment towards The Lost Boys' awesome soundtrack featuring INXS, Echo and the Bunnymen, and numerous others, The Goonies comes out on top. While The Lost Boys is one of the best vampire films to come out of the '80s, The Goonies gains a notch for maintaining all these years later. Although, The Lost Boys still looks and sounds invariably better than many other pieces from that era, The Goonies' core story and our sense of nostalgia towards vintage Spielberg stylings forces us to hand this one over to a bunch of wise cracking, treasure hunting little kids that outwitted a maniacal old woman and her mentally unstable sons. Post by The Movie Sleuth.